Navigating the transition from service to civilian life is not always easy and no veteran should have to experience it alone. 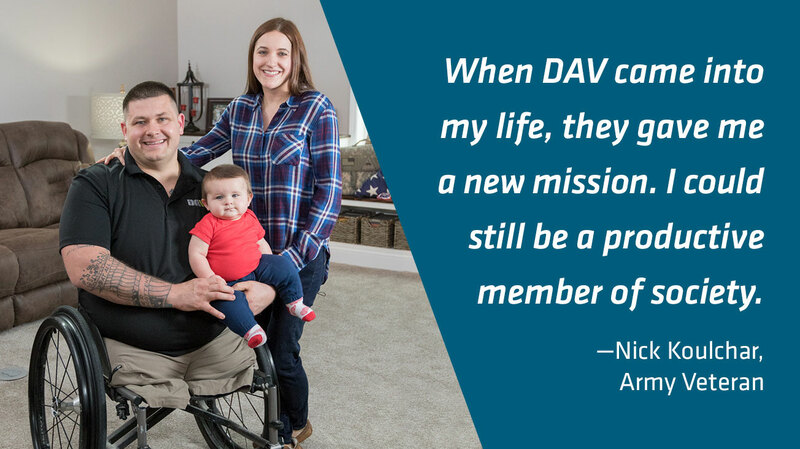 DAV provides a lifetime of support for veterans of all generations and their families in positive, life-changing ways. Your gift will ensure veterans and their families can access the full range of benefits they deserve, provide care and support during tough times, advocate for the veteran community on Capitol Hill, connect veterans with meaningful employment, and so much more. Did you know DAV is charged a 3% transaction fee on your gift? I want to make my gift go further by covering the online processing fee. By making a gift to DAV you are empowering veterans to lead high-quality lives with respect and dignity. Copyright © DAV, All Rights Reserved. The Disabled American Veterans (DAV) is a 501(c)(4) tax-exempt charity, IRS EIN 31-0263158. All contributions to DAV are tax-deductible according to IRS regulations.